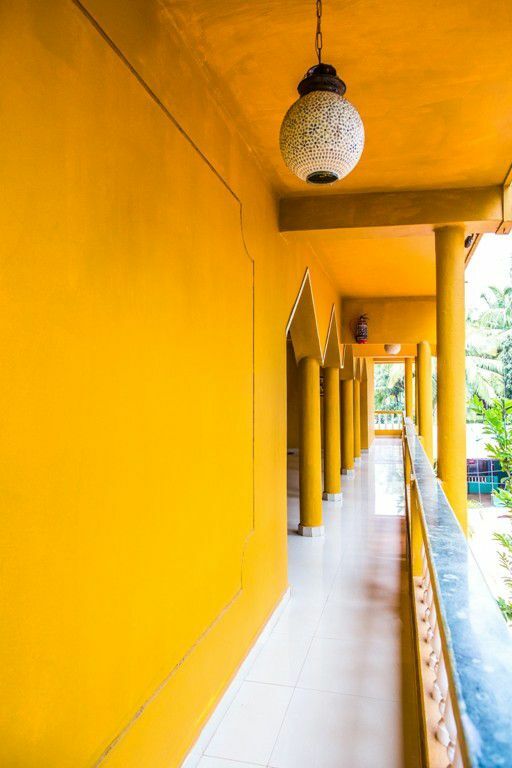 Spending the festival of colors in the tropical gardens of the Devarya Yoga & wellness retreat in Goa is a delightful experience. During the onset of spring, an enormous yoga festival is arranged to enjoy the mystical spirit of India. 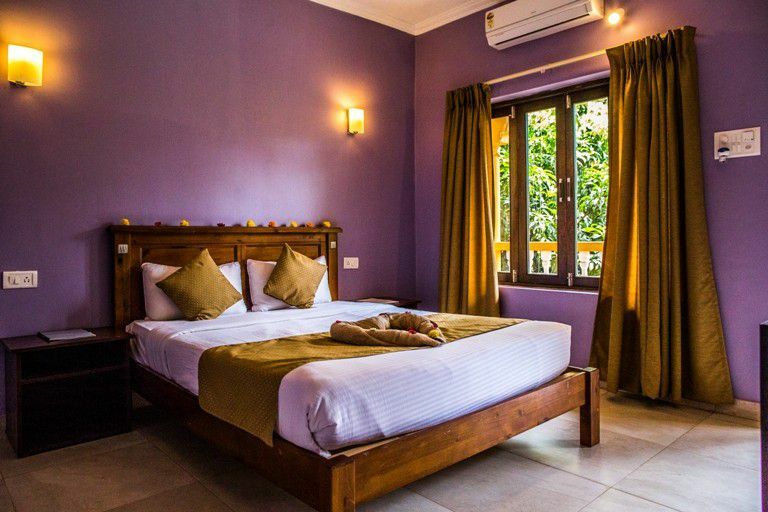 The evergreen yoga & wellness retreat is specially designed with a bouquet of Chakra themed rooms for rejuvenating the inner energies and exploring the relaxing vibes. A cast of serenity fills the air when various colors mix in the air along with the relaxing ayurvedic massage and delicious cuisines. 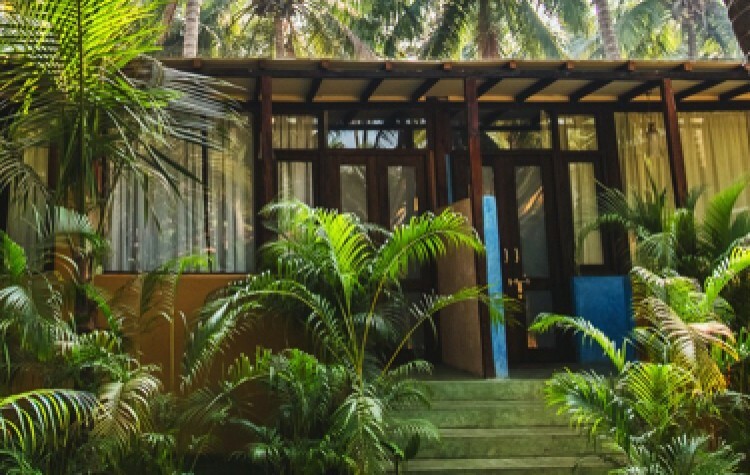 While planning a yoga holiday during the spring, visitors can select the Holi & Spring Equinox Yoga Festival and Wellness Retreat at Devarya Goa. In this yoga package, seven nights of accommodation in the Charka rooms along with buffet-style breakfast and dinner is served. Besides, there is a provision for hot drinks and beverages and use of full resource amenities. A special attraction of this yoga holiday is the practice of Hatha Yoga twice daily and provision for two ayurvedic massages during the stay. Celebrating the festival of colors, Devarya Wellness Resort arranges also arranges for Holi celebrations, beach bonfire, and spring equinox fire puja. Special attention is given to serve organic food made from locally made spices for enjoying a healthy vacation. Overlooking the mesmerizing Morjim Beach, Devarya Wellness is an eco-friendly retreat located in the serene seaside town of Goa. Encompassing an area of 7000 sq.m, this yoga and wellness retreat in Goa provides an amicable means of escaping from the monotonous busy days of everyday life with its various forms of yoga sessions. Devarya, meaning a divine belief in spirituality inspires yogis, beginners, and seekers to experience the mindfulness of holistic yoga training. In the Devarya yoga & wellness retreat, there are skilled yoga professionals with years of experience in practicing Hatha yoga, Vinyasa yoga, Osho meditation, and Iyengar yoga. They help visitors enjoy a relaxing yoga session and as well trains them for an advanced training program. At this Yoga & wellness retreat, one can completely immerse in the serenity of the ambiance and enjoy yoga session with like-minded souls. Besides undergoing extensive yoga training for adults, at Devarya Wellness there is also provision for kids’ yoga teacher training, which enables enthusiastic teachers, take active participation and learn about the various ways of developing the mental and physical health of children. 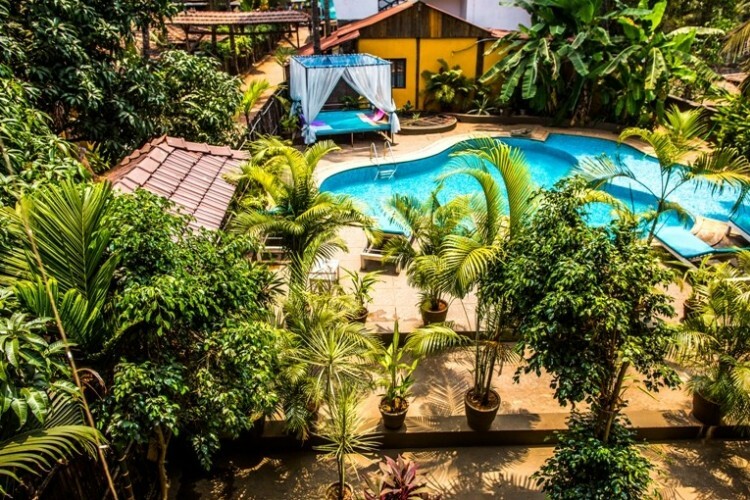 Apart from the holistic yoga programs, the scenic beauty of this eco-friendly retreat in Goa is ravishing. The resort also houses two marvelous swimming pools, of which the leisure pool named Soma is ideal for children, while adults can relax in the blue water of Luna. Surrounded by sun loungers, the Devarya Yoga & Wellness retreat is pure bliss to enjoy a break from the urban lifestyle and rejuvenate the mind. 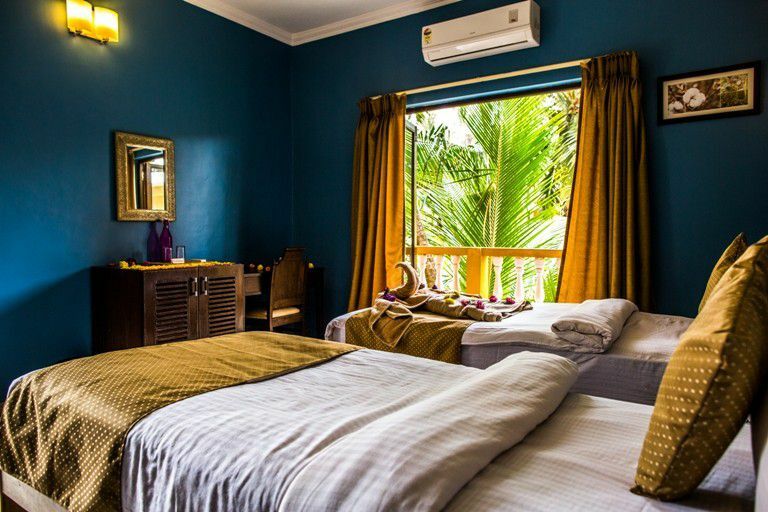 The accommodation at the Devarya wellness resort is set in the lush green tropical gardens overlooking the Morjim Beach, commonly called the Turtle beach. The luxury and serenity of this eco-friendly retreat provides a break from the monotonous lifestyle for rejuvenating and energizing oneself. 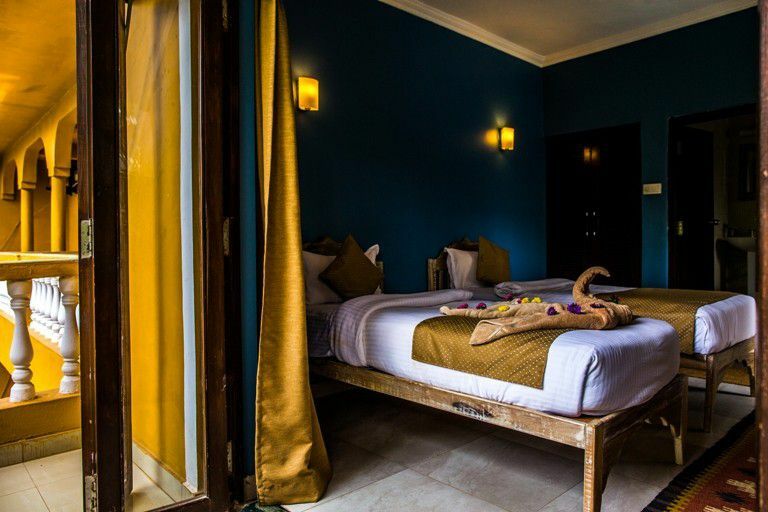 The spacious rooms in this yoga & wellness retreat have a marvelous architectural blend of aesthetic Rajasthani royalty and Goan Portuguese heritage. The rooms at this eco-friendly resort are spacious, vibrant, full of light, and airy. 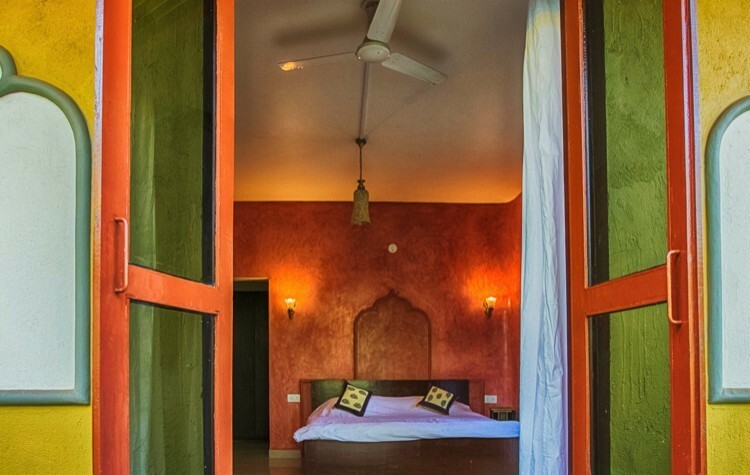 Chakra Standards overlooks the lush green tropical gardens and has an attached balcony. 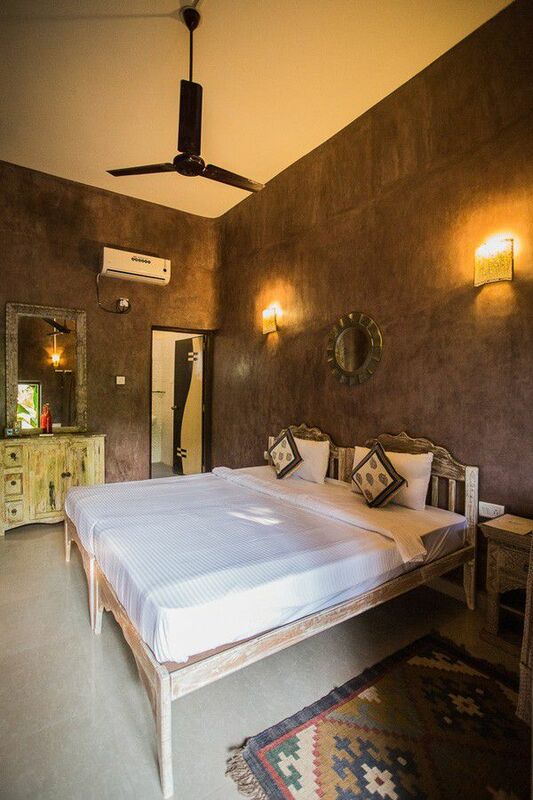 Tastefully furnished with wooden and earthy décor, the rooms bring emits an aura that brings an individual closer to nature. Following the seven main energy centers, there are several chakra rooms namely Ajna, Anahata, Manipura, Muladhara, Sahasrara, Swadhisthana, and Visuddha. 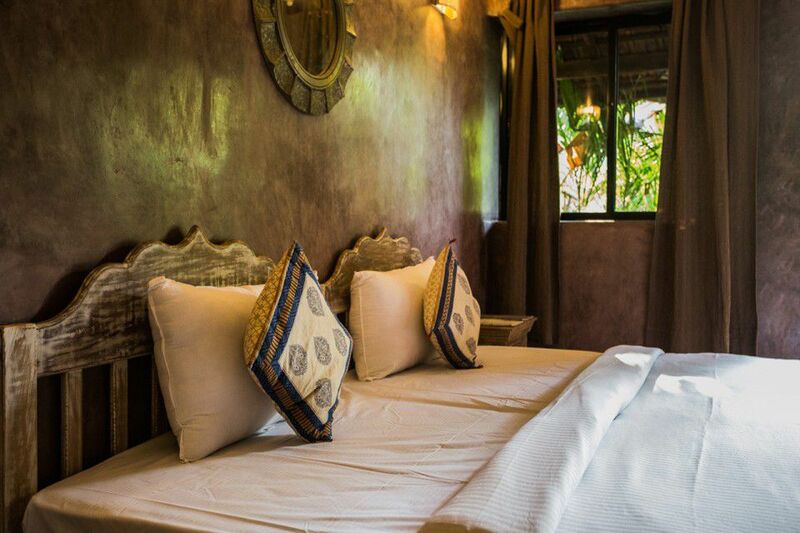 The traditional designs in these rooms include the colors of various chakra, which influences the spiritual, physical and emotional well being of an individual. 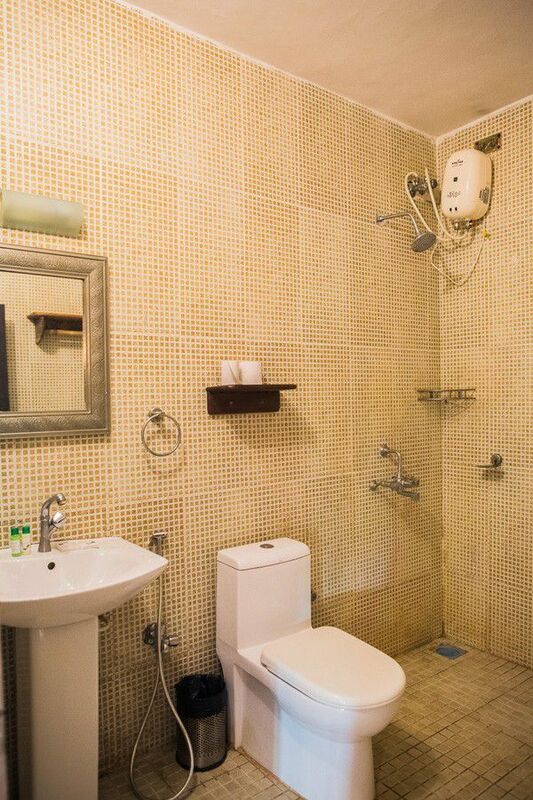 Besides, there are chakra cottages and Chakra Cottage juniors along with luxurious designed royal villas for those willing to spend a luxurious yoga holiday. The complete package of yoga and meditation is incomplete without a platter of a healthy and organic diet. Thus, Chia Lounge, the beautifully crafted in-house restaurant at Devarya Yoga & Wellness retreat aims to serve organic, healthy, and wholesome food with healthy beverages for the visitors. The intrinsic décor of the two-storeyed restaurant with a beautiful garden and a remarkable view of the sea create a serene ambiance. The Chia Lounge takes pride in using locally made products to serve delicatessens that can enhance one’s wellness journey. The buffet and A La carte menu at this restaurant are designed with minimal wastage of food while ensuring the enhanced food quality. During ones' stay at this eco-friendly resort, this restaurant serves its guests throughout their yoga holiday. The place specializes in serving vegan, and gluten frees dishes. Besides, they can as well customize the diet as per one’s dietary plans. It is indeed a refreshing beauty to enjoy the setting sun on the blue horizon while sipping freshly made juices at the Chia Lounge. Deposit requirement is 30% of your total holiday cost and should be paid at the time of booking. The remaining balance then please must be paid in full, two months before your arrival date to Devarya Wellness. Full payment is required should your booking be made within two months of arrival. We would like to remind you that all deposits are non-refundable or non-transferable. Whilst it is unlikely that we shall have to make changes to holiday bookings or other matters, we reserve the right to do so at any time. We shall inform you as early as we are able to in the event that this is necessary. Cancellations made 0 – 30 days before the start date of your holiday will be entitled to a 0% refund. Cancellations made 31 – 60 days before the start date of your holiday will be entitled to a 50% refund. In the unlikely event that Devarya Wellness is unable to fulfill a yoga holiday booking we will refund 100% of your payment or offer you an alternative arrangement. However Devarya Wellness will not be accountable for flight costs or other costs incurred outside of the yoga holiday package. 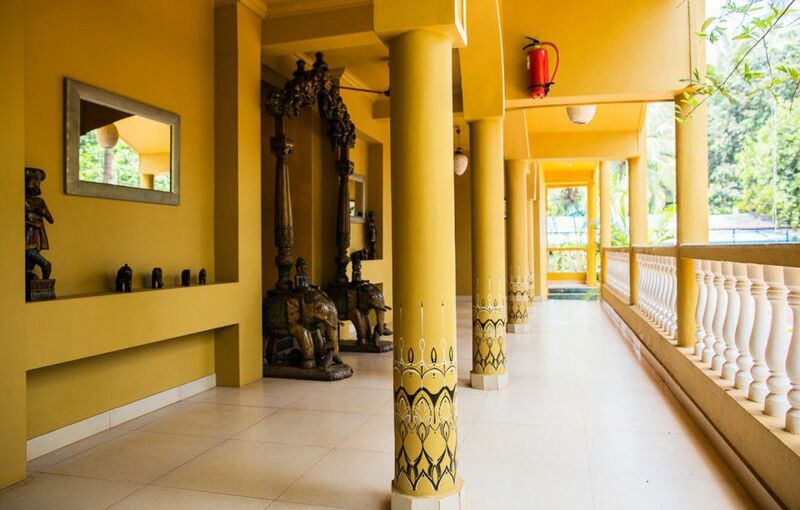 Our Chakra Standards are situated at the centre of our resort, in a building opposite our leisure pool with views of the beautiful tropical gardens and palms. hakra is a Sanskrit word translating into “spinning wheel”. Ancient yogic wisdom tells us there are seven main energy centers in our body. Each of our chakras flows with a color-coded vibration frequency in the universe which can influence our physical, emotional and spiritual well-being. When our chakras are perfectly aligned with the universal flow of energy, every aspect of our life becomes harmonious and we are able to connect to our bliss. 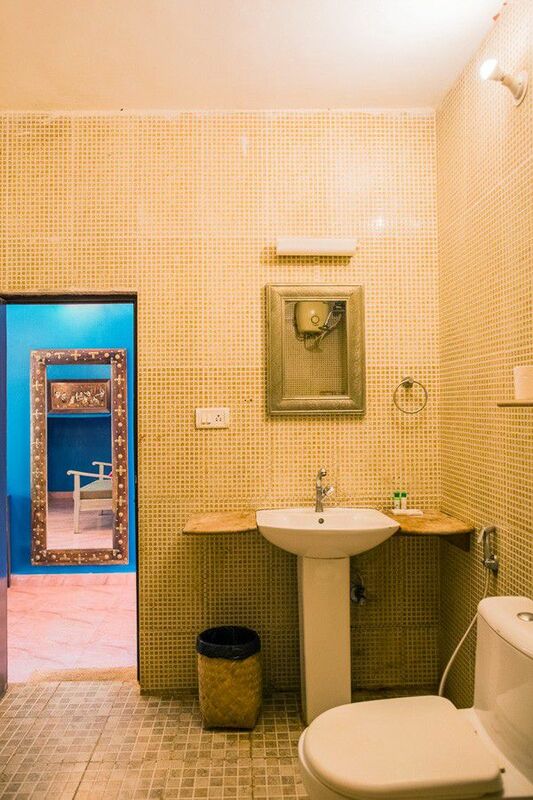 At Devarya Wellness, we have carefully designed Chakra rooms and cottages to compliment to various chakras. 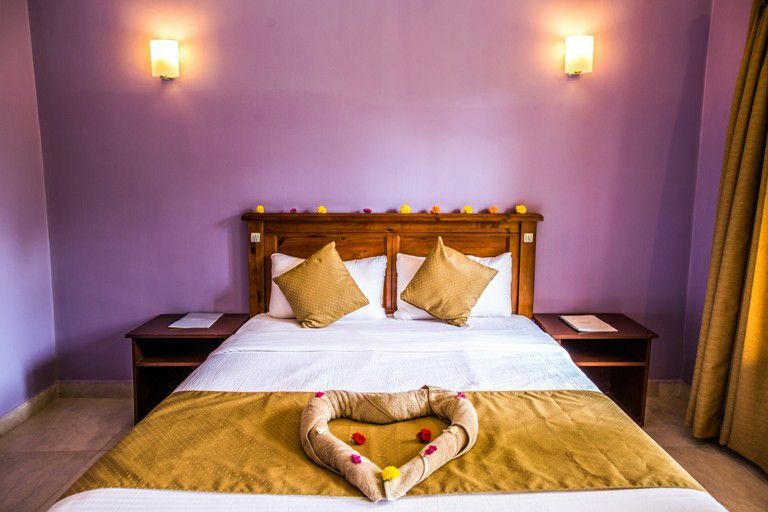 Our Chakra Cottage Juniors are smaller in size and have only a kingsize bed, ideal for couples, lone travellers or friends who do not mind to share a bed. Chakra is a Sanskrit word translating into “spinning wheel”. Ancient yogic wisdom tells us there are seven main energy centers in our body. Each of our chakras flows with a color-coded vibration frequency in the universe which can influence our physical, emotional and spiritual well-being. When our chakras are perfectly aligned with the universal flow of energy, every aspect of our life becomes harmonious and we are able to connect to our bliss. 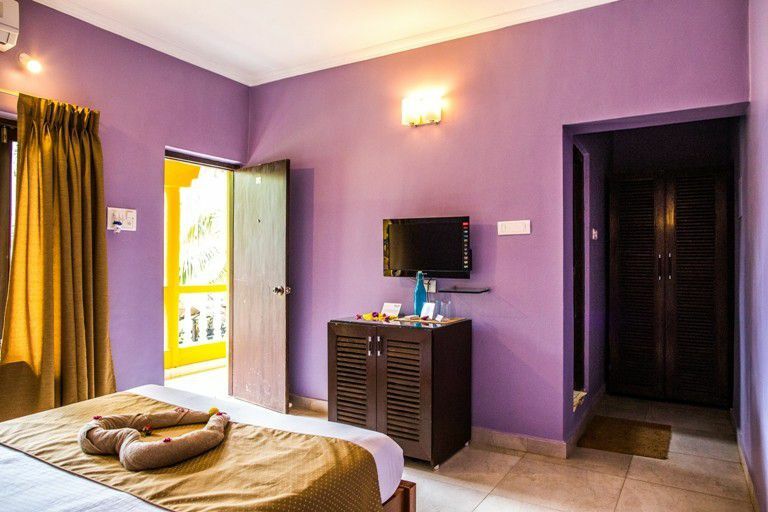 At Devarya Wellness, we have carefully designed our colourful Chakra rooms and cottages to compliment our various chakras.